The first step in fulfilling the Friends’ New Year’s Resolution to address the problem of invasive plants on the OCA was taken on January 6th. 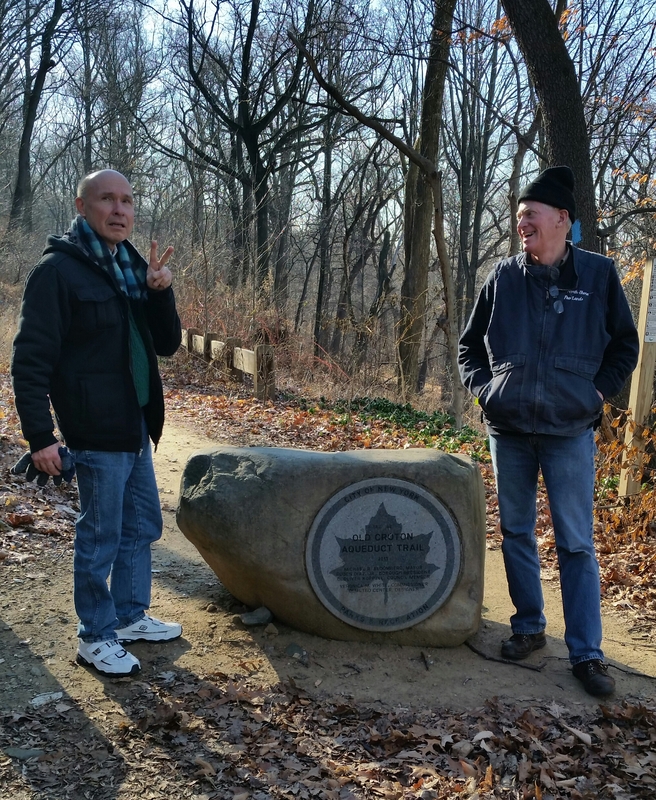 On that Wednesday, Steven Oakes, Historic Site Manager for the OCA, drove his trusty jeep along the trail from the beginning of the Westchester section to the Croton Dam in Cortlandt, taking as passengers a group of Friends volunteers for a reconnaissance mission. Our goal was to take a winter look at the trail from top to bottom to see what sections were being most affected by invasive plants during this leafless season. What struck us most were the incredible number of areas that were being overrun by invasive vines climbing over trees and bushes. We made particular note of those areas where the vines were impeding views, including panoramas of the Hudson River. Our findings matched the results of the invasive plant survey spearheaded over the past two years by the Friends with expertise and leadership provided by the NY-NJ Trail Conference, in which porcelainberry vine was found to be the second most ubiquitous invasive plant found on the OCA (stilt grass was the first). As an organization the Friends are taking a leadership role in evaluating the findings, together with the survey results and input from interested trail users to develop priorities for attention. Attention? Does that mean we can actually do something? Well, yes we can if we are strategic about what we do by picking our battles, carefully choosing our techniques, obtaining help from our Aqueduct neighbors, researching and accessing available resources and searching for and obtaining additional funding. Individual Friends members could take on the challenge of dealing with the invasive plants in a specific section of the trail and do so over time. This is what I have done. Starting in 2012 I hosted I Love My Parks Day one day invasive removal events on the first Saturday in May. Our groups of volunteers, including corporate sponsor SavATree, and with the help and support of State Parks personnel attacked vines, bushes, garlic mustard and other plants in the northernmost section of the trail; after four years of doing this we have made considerable progress. Last year we had 45 attendees; the year before we had 65, including the NY State Parks Commissioner, Rose Harvey. See HERE for the blog. Click HERE for a photo album of the 2015 event. Despite our efforts, many areas of infestation remain, with no hope of taming them with annual one day events. I live along the trail, walk it frequently and see new invaders blossom, fruit and spread their seeds. So I have made a commitment to hire an invasive removal crew from the NY-NJ Trail Conference this summer; four trained AmeriCorps members will spend a week of concentrated effort and we will see what can be accomplished in that time. After the crew leaves I will continue to walk and monitor that section of the trail with an eye toward finding ways of continuing to tackle invasive plants that remain or emerge. The take home message is that if individuals or groups wish to select an area and make a commitment to work on it for a day, or over a season or even a year or more, they can make a significant difference. That is what my friend and neighbor Daria Gregg has done. She has taken classes in invasive plant identification, attended the annual I Love My Park Day events and researched proper removal techniques. She selected a section in Ossining close to her home, contacted Steven Oakes, the Manager of the Park, for permission and over the summer and fall spent many weekend hours removing invasive plants with the help of some local workers she hired to assist. The final removal day this fall included a few volunteer Friends members. Later in the season the State Parks crew came and chipped that debris pile. Bravo Daria! She plans to continue the work in the seasons to come. So consider becoming involved. Here is a summary of actions you could take. Nominate a section of the trail for attention. Send me your nominations; see below for contact information. Plan to participate in one of the two I Love My Park Day events to be held in the northern and southern parts of the trail on May 7. Put the date on your calendars and watch the website for details. Offer funds for to support the volunteer efforts or to hire professional invasive removal crews. There are expert crews which can be hired to work in specific sections if there are friends and neighbors who wish to improve an area of concern and are willing to band together to pay for the work. We are hoping to find a pot of gold at the end of the rainbow. Please contribute to that pot! For further information or to offer help, contact me via email dalden@aqueduct.org or call (914) 941-8536.